Location: Pope Auditorium, Fordham Law School, New York. This panel will examine the Internet’s dual impact on democracy and extremism. Panel members will explore how social networks, blogs and websites have been used simultaneously to spread democracy and promote hate. They will discuss the tensions that arise on the Internet between these competing interests. This panel will explore how we distinguish hate speech from legitimate political expression and whether such a line can be drawn. Panel members will consider what characteristics make hate speech dangerous and different from democratic political debate. The panel will consider specific examples of online “hate sites” and other ways that the Internet has been used to spread extremist thought. • Nicole Wong, Vice President & Deputy General Counsel, Google, Inc. This panel will explore the competing cultural concerns about hate speech that make international regulation challenging. Panel members will consider how the definition of hate speech and norms about regulation differ internationally. This panel will explore various ways that we can combat or prevent hate speech online while still allowing robust democratic expression. Panel members will consider regulatory and non-regulatory options and will discuss which methods best serve the dual goals of promoting democracy and tolerance. The conference is free and open to the public. 6 Non-Transitional, Professional Practice NYS CLE Credits are available for $90 ($50 for Fordham Law alumni & public interest attorneys). If you desire CLE credit please register online and complete and submit a copy of the PDF registration form provided below as instructed. Fordham Law School has a financial hardship policy for the conference. For additional information please visit: http://law.fordham.edu/cle. 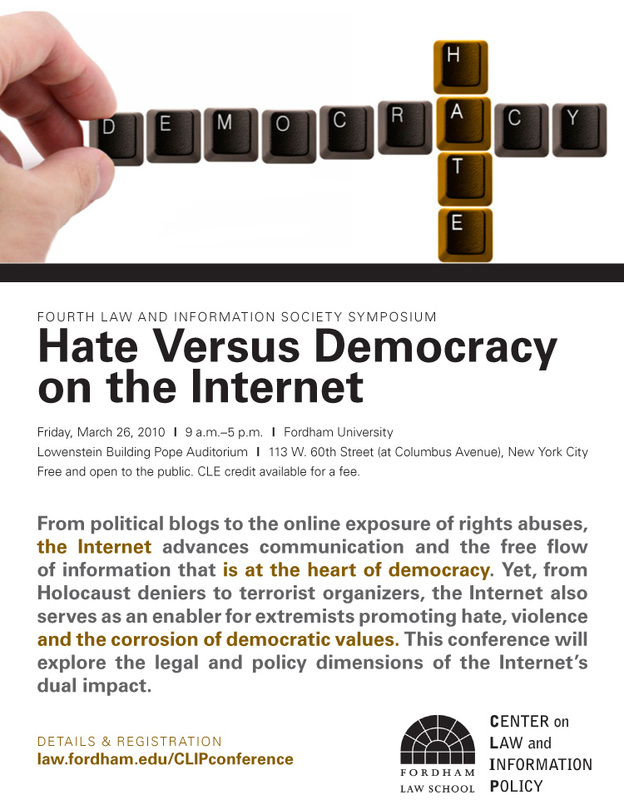 Be the first to comment on "Fourth Law and Information Society Symposium: Hate Versus Democracy on the Internet"